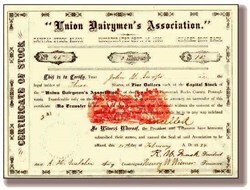 Beautifully engraved Certificate from the Union Dairymen's Association incorporated in 1883. The assoication was headquartered int the Township of Plumstead, Bucks County, Pennsylvania. The certificate was issued from the 1880's - 1890's. This historic document has an ornate border around it with a red underprint of a Quaker family including a man leaning over the fence talking to his wife and son next to a cow. This item is hand signed by the company's president and secretary and is over 100 years old. There is also a very unique watermark in the certificate from the printer "1776 - 1876 Centennial TWP Company". The paper used to print these certificates celebrated the country's first centennial in 1876 with this watermark. Bucks County (population 541,000) was one of the original counties created by William Penn in November, 1682. Bucks is a contraction of Buckinghamshire, an England shire where the Penns lived for generations. Doylestown, the county seat, was named for William Doyle, an innkeeper. The actual certificate looks much nicer than the scan appears.